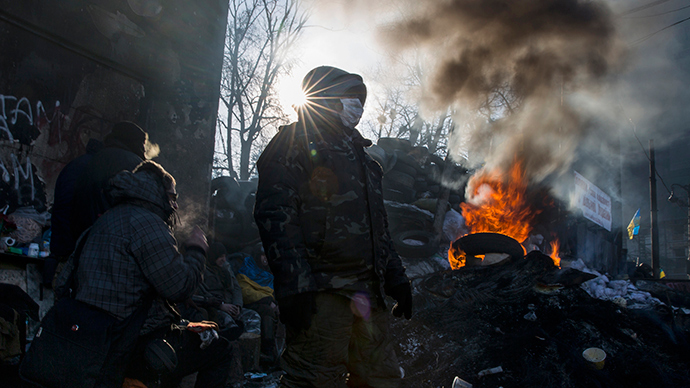 The turmoil in Ukraine has been at the center of international attention for over a year now. In 10 dramatic videos, RT recounts the bloody events of winter 2014, which heralded the coup in Kiev and was followed by civil war in eastern Ukraine. The initially peaceful demonstrations on Kiev’s Independence Square – known round the world as the EuroMaidan protests - started in November 2014 as a reaction to the then-President Viktor Yanukovich’s refusal to sign the EU association deal. However, by mid-February they spiraled out of control with protesters and police clashing violently and spilling blood on the streets of the Ukrainian capital. The bloodshed began on February 18 as the city descended into chaos after talks between Yanukovich’s government and the opposition failed. The next few days turned out to be the bloodiest as Kiev’s city center became a battlefield, claiming around 100 lives. 1. Protesters tore up the pavement and threw rocks at police, who were initially ordered to refrain from violence. They also used metal chains, pepper-spray and even brought in a digger to intimidate officers. 2. Riot shields failed to provide police with any protection against Molotov cocktails thrown at them from the crowd. This dramatic video shows the officers turning into human torches and only avoiding fatal injuries thanks to fire brigades working on site. 3. The footage released by the Ukrainian Interior Ministry shows the protesters using firearms, torching vehicles and tires on the chaos-ridden Kiev streets. 4. The fighting continued into the evening, as protesters assembled barricades and hurled Molotov cocktails at security forces. 5. This video shot from the top floors of the building adjacent to Independence Square – the heart of the protests – shows a police vehicle ramming into barricade, which the people behind set ablaze. 6. Maidan Square (also known as Independence Square) was never dark or quiet during these nights of unrest. It was lit up by burning tires and fireworks, as police forced the protesters back with water cannons and engaged in running street battles. 7. Many were reportedly killed by unidentified sniper fire from the top floors of the buildings overlooking the main protest site. 8. Police used live ammunition against the protesters on the streets. This footage was shot on Institutskaya Street, next to Maidan Square, another scene of violent skirmishes. 9. There were a great number of law enforcers deployed to disperse the raging crowds, but they weren’t always able to hold their positions. The video below shows protesters pushing a truck into a line of shield-bearing riot police, and then torching them with Molotov cocktails. 10. Maidan Square transformed beyond recognition during the unrest - massive clouds of black smoke rose from the historic city center and the buildings on the square were partly destroyed.